13 Amazing Coffee Scrubs For Face And Body That Will Make Your Skin Oh-So-Smooth! Silky smooth skin is something that we all desire to have. And what if we tell you that you can get such smooth and soft skin with your favourite ingredient, that is ‘coffee’? Yes! You heard it right people. In this article, we will be giving you a list of 13 best coffee scrub for face and body that will make your skin oh-so-smooth. Here have a look at the article to know the details. Want to exfoliate your face? Looking for a nice face scrub? Here are the 5 best coffee scrub for face that you can use to make your facial skin look glowy and smooth. Have a look! The arabica coffee scrub is made with natural gourmet coffee that helps to soften the skin as it scrubs away the accumulated dirt and dead skin cells by exfoliating the skin. Also, it helps to improve blood circulation and promotes healthy-looking skin with better cell regeneration. Price: Rs 599. Buy it here. This coffee scrub for face by Hilary Rhoda helps to tone the skin and removes blackheads. It contains properties that help to control the oil accumulated on the skin by cleansing it and keeping the skin hydrated. Price: Rs 275. Buy it here. Good vibes pore cleansing scrub with the key ingredient coffee helps to make the skin smoother and softer. It is an amazing scrub that even removes blackheads and makes the skin clean and fresh. Price: Rs 195. Buy it here. 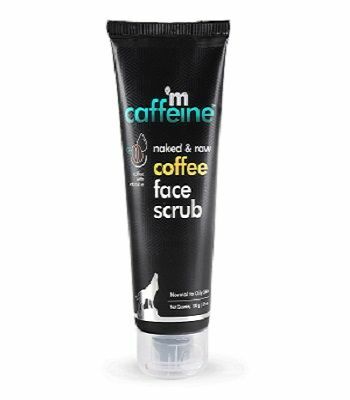 Naked and raw coffee face scrub contains vitamin E. The formula of this scrub is amazing that buffs away all the dead skin cells, making the skin look clearer. Also, it does not contain paraben and SLS that makes it suitable to use on the skin. Price: Rs 349. Buy it here. Using the nature’s co. coffee face scrub is the best option to pamper your skin. It is a vegan product, so anyone can use it without any worry and the product will work just amazing. Price: Rs 1,095. Buy it here. Looking for a product to enhance the effects of your grooming sessions? Here are 5 best coffee body scrub to make your skin oh-so-smooth. Have a look! 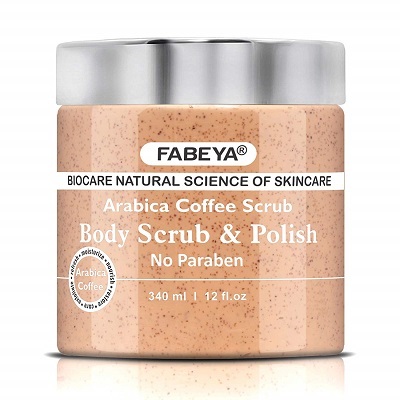 Massaging this Fabeya arabica coffee body scrub and polish on the skin in a circular motion helps to reduce cellulite from arms, legs and body. This product contains no paraben and helps to make the skin glowy and polished. This organic coffee scrub by the beauty co. combats cellulite, minimize and tightens the pores. Also, by exfoliating the skin, it hydrates the body and prevents premature ageing. This is the best coffee scrub for acne that you must try. Price: Rs 399. Buy it here. This coffee exfoliator by wow arabica is an organic coffee scrub that helps to nourish the skin and makes it look flawless. This is the best coffee scrub for cellulite and stretch marks that you must try. Price: Rs 649. Buy it here. As we know coffee scrub benefits are many, so you must know that this coffee scrub by BFF skincare and fragrances helps to improve blood circulation, reduce stretch marks, combats cellulite and gives clear and beautiful skin. It is a steal deal at a good price. Price: Rs 450. Buy it here. This coffee scrub by SkinYoga is really beneficial for the skin, it is enriched with pure sesame oil, ground coffee beans and pure coconut oil. Also, it is a natural moisturizer that nourishes the skin and makes it look glowy. Price: Rs 1,795. Buy it here. Love using natural products on your skin? Here are 5 best homemade coffee scrub recipes that you can surely. Go and DIY coffee scrub! Coffee and coconut oil scrub is an amazing combination. As coffee helps to remove dead skin cells and coconut nourishes the skin. You can also add lemon juice while preparing this coffee scrub for face as lemon juice helps to brighten the skin. Using this coffee scrub helps to refresh the skin and makes the skin smoother. Coffee sugar scrub is one of the best scrubs that you can make at home. It helps to exfoliate the skin properly. You can even add olive oil in the mixture to make the skin highly nourished. Also, in total, this scrub contains antioxidants that help to improve skin health. All you need to do is massage this scrub gently as sugar granules can hurt your skin if massaged with pressure. The combination of coffee and honey is highly nourishing that helps to make the skin smooth. And as honey contains antiseptic and antibacterial properties, so it gives healing effect on the skin. Now that we know the best coffee scrubs available online or the ones that we can make at home, so let us now have a look at the benefits of coffee scrub. Have a look at the list of coffee scrub benefits. A coffee scrub is an amazing exfoliator that helps to remove the dead skin cells from the skin that makes the skin softer and smoother. You can use a coffee scrub while bathing because the aroma filled with coffee fragrance will awaken all your senses and you will have a great bathing session. Using a coffee scrub for face and body helps to improve the blood circulation of all the body parts. And by improving the circulation it also helps your body cells to get proper nutrients and oxygen that later on makes the skin glow. Using a coffee scrub boosts the regeneration of cells, removes dead skin cells and dirt too. And all this not only make your appearance better, but it also tightens the skin that makes you look younger. Also, it helps to make the skin even and remove dark spots. As per the studies, caffeine helps to reduce the appearance of cellulite gradually. All you need to do is to apply the coffee scrub and massage it gently on the areas where you want to reduce the cellulite. So, these were the 13 best coffee scrub for face and body that you can easily DIY or get from the market.